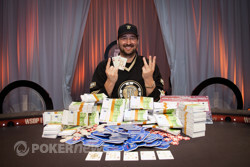 Congratulations to Phil Hellmuth, Winner of 2012 World Series of Poker Europe Main Event (€1,022,376)! Phil Hellmuth wins the WSOPE Main Event! Wow. He's done it again. Earlier in the summer Phil Hellmuth was able to silence the critics when he won his 12th World Series of Poker bracelet. Less than four months later Hellmuth was able to overcome a field of 420 players to capture his 13th bracelet as well as the €1,022,376 first-place prize money. Not only does this win extend Hellmuth's lead as the player with the most WSOP titles, but it also makes him the only player to ever win both the WSOP Main Event and the WSOPE Europe Main Event. It is the perfect cap to Hellmuth's WSOPE, as he managed to score an impressive four cashes during this series. As if all of that weren't enough, this win also puts Hellmuth in the lead for the WSOP Player of the Year race. With all of that being said, the path to glory was not an easy one. A total of 420 players took to the felt over two starting days on their quest to join the elite group of players to win a WSOP Europe Main Event. By the end of the two starting days only 77 players remained. Among those to make it to the second day of play only to find their tournament come to an end were Day 2 chip leader Michael Mizrachi, Vanessa Rousso, Phil Ivey, Scotty Nguyen, Antonio Esfandiari, Andrew Lichtenberger, Joe Hachem, and October Niners Russell Thomas and Jake Balsiger. Day 3 saw Sergii Baranov hit the felt with the chip lead - a position that would eventually be occupied by Joseph Cheong by the day's end. Several other big names also returned to the felt and were unable to attain a spot in the money among the top 48 players. Sam Trickett, Jean-Robert Bellande, Tobias Reinkemaier, Dan Smith, and Martin Jacobson are just a few of the players to fall short of cashing. The bubble finally burst when October Niner Jesse Sylvia moved all in with against the of Cheong. Syliva failed to improve against the tens and was forced to settle for the title of "bubble boy". Fortunately for Sylvia, he will be taking the chip lead to the final table of another little tournament you may have heard of - the WSOP Main Event - which will take place at the end of the month. The 24 players that returned for Day 4 were all guaranteed money, but instead had their sights set on the top prize and the gold bracelet that came with it. This day saw the exit of many big-name players on the way to the final table. Joe Kuether, Andy Frankenberger, Liv Boeree, Max Silver, Kyle Julius, and Scott Seiver all saw the rail before play ended for the day. After the final nine combined for the unofficial final table, Timothy Adams became the bubble boy when his was unable to improve against Christopher Brammer's . Jason Mercier came into the final table as the short stack and did not have much wiggle room while seated at a table that seemed to be playing big pots. Mercier became the first casualty when he moved his stack of 465,000 all in from middle position only to be called by Baranov from the next seat over. The rest of the table folded and Mercier showed only to find that he was dominated by Baranov's . The room watched anxiously as the board fell , thus sealing Mercier's fate as the eighth-place finisher. Mercier finished in fifth place in this event three years ago, and unfortunately was not able to best that finish in 2012. He did, however, collect a nice payday of €84,672 for his finish. Not long after, Stephane Girault three-bet his short stack of 300,000 all in over the top of a raise to 60,000 by Cheong that was also called by Hellmuth. Cheong got out of the way, but Hellmuth opted to call. "I've got a good feeling about this one," said Hellmuth before the cards came out. The flop fell , and it seemed that Hellmuth may have spoke too soon. However, the deck seemed to hold true to Hellmuth's gut feeling, as the fell on the turn giving him an open-ended straight draw. The made his straight on the river and sent Girault home in seventh place. Paul Tedeschi, the youung French newcomer to the tournament scene, was the next to see his tournament come to an end when he moved all in for his last 470,000 and was called by Cheong. The flop brought Tedeschi a diamond draw as it fell . The turn and river, however, were neither aces nor diamonds, but rather the and the , which allowed Cheong's queens to hold and ensured Tedeschi a sixth place finish. Tedeschi's performance in this event netted him his largest tournament score to date, pocketing a €149,184. Brammer was crippled after he called the all in of Stephane Albertini. Albertini held to Brammer's . Brammer paired his ace on the flop, but ultimately ran into a heart flush on the river for Albertini. Brammer moved all in from the button a few hands later and was called by both Baranov and Hellmuth. Brammer held but was out-flopped by Baranov's on the board of . After Brammer's elimination, the players took a four-hour break due to television scheduling. When they came back, they played four-handed for quite some time until the action at the table came to a head. Cheong raised to 115,000 before the flop and was called by Albertini and Baranov. The flop fell and Albertini checked. Baranov bet 225,000 and Cheong quickly announced that he was all in. Albertini folded and Baranov quickly called. Cheong would need to fade a king or a diamond to stay alive in the tournament. Unfortunately that simply was not in the cards, as the rolled off on the turn to give Baranov his flush. The completed the board and Cheong was eliminated in fourth place, taking home €292,320 for his efforts. The remaining trio of players then played for almost two hours, exchanging chips and letting emotions fly as they did so. After crippling Albertini in a prior hand, Hellmuth finally opened with a raise to 320,000 from the small blind. Albertini moved all in for about 900,000 and Hellmuth snapped him off with . Albertini was ahead with and would need to fade Hellmuth improving to score a double up. The flop and turn were safe as they came . The room let out a collective gasp of shock though when the drilled the river, giving Hellmuth the winning set and eliminating Albertini from the tournament. This elimination brought about heads-up play where Hellmuth had a commanding chip lead. The heads-up battle did not last long. Hellmuth seemed to take no prisoners as he raised a majority of the bets that Baranov made. A mere few hands into heads-up play saw Baranov limp from the button, Hellmuth raised 300,000 on top and Baranov replied by moving all in. Hellmuth quickly called. "I'm going to win this right here," Hellmuth chimed. Hellmuth turned to his supporters on the rail as he could not bear to watch the cards fall. The flop was and still Hellmuth did not look. The came on the turn and paired both players, giving Baranov a glimmer of hope with some additional outs to chop. Unfortunately for Baranov, he did not pair up or hit his chop outs, as the struck the river, sending Hellmuth into the air as he jumped up and down with sheer joy. The win puts Hellmuth at the top of the leader board for WSOP of the Year. The only way that Hellmuth will be overtaken is if Greg Merson is able to win the final table of the WSOP Main Event at the end of October. "This is the best tournament I've ever played in my entire life," Hellmuth said after winning his thirteenth bracelet. "I was all in for my tournament life once and that was on Day 1. He had one out." PokerNews would like to extend its sincerest congratulations to Phil Hellmuth for once again conquering a stacked field to take down one of the most prestigious poker titles of the year. That does it for our coverage of the World Series of Poker Europe. Be sure to tune in at the end of the month when the Octorber Nine hits the felt to crown the newest WSOP champion! A full recap of the day's action will follow soon, so stay tuned. Sergii Baranov limped from the button and Phil Hellmuth simply said, "Three hundred more." "Call," Hellmuth snapped. "I'm going to win this right here." Hellmuth had the dominant hand, but he couldn't bear to watch. Instead, he turned to his supporters on the rail with his back turned to the table. The flop fell , and still Hellmuth did not look. The turn paired both and gave Baranov some chop hopes, but it was not meant to be as the appeared on the river. With that, Baranov finished as runner-up to the all-time bracelet winner, who extended his lead to 13 bracelet in one of the world's most prestigious tournaments. "It's the best tournament I've ever played in my entire life," Hellmuth said to his friends after the hand. Phil Hellmuth had the button. He raised to 160,000 and Sergii Baranov called. The flop came and they both checked. The prompted a 200,000 bet from Baranov. Hellmuth opted to raise to 500,000 and Baranov mucked. The next hand Baranov made it 200,000 from the button and Hellmuth called. The flop fell and Hellmuth check-called 250,000. The came on the turn and the action went check-check. The finished the board. Hellmuth checked and Baranov bet 270,000. 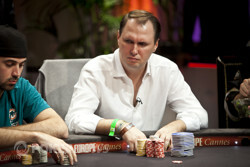 Hellmuth raised to 1,270,000 and Baranov mucked his cards. Sergii Baranov raised to 190,000 and Phil Hellmuth made the call before checking dark. Baranov then bet 120,000 on the , and again Hellmuth called and then checked dark. The turn was put out, Baranov bet 250,000, Hellmuth called, and then both players checked the river. "Ace high," Hellmuth said. Baranov then rolled over to win the pot. The flop read and Sergi Baranov checked to Phil Hellmuth on the button. Hellmuth bet 125,000 and Baranov called. They both checked the turn and the hit the river. Baranov checked to Hellmuth who bet 300,000. Baranov folded and Hellmuth took the pot. The stage is set for heads up. Before beginning heads up play, players are now on a fifteen minute break. 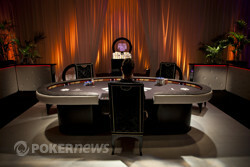 Final Table Chip Leader Phil Hellmuth Looks to Capture Bracelet #13 & WSOP POY in Cannes, France! Phil Hellmuth wins his 13th WSOP Bracelet. Phil Hellmuth jumps in excitement when he realizes he is going to be WSOPE Main Event Champion. Stephane Albertini is all in against Phil Hellmuth. Hellmuth bust Albertini in 3rd place.